COLLEGE STATION, Tex (KBTX) - High pressure is tightening its grip on the state of Texas, and the Brazos Valley is up next for triple digit temperatures starting Thursday. A Heat Advisory will likely be issued for the rest of us going into the weekend, where peak heat is expected. Take extreme care in the outdoors the next few days! Drink more water than normal and take frequent breaks. 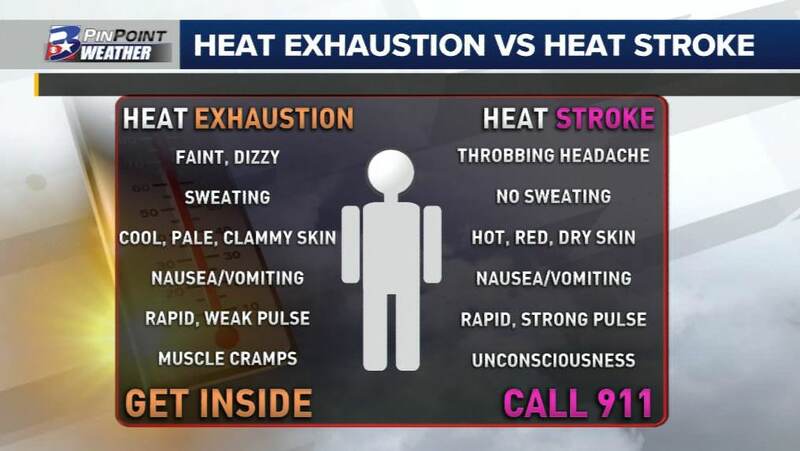 Below is a brief guide on knowing the difference between someone who is suffering from heat exhaustion (which is still serious) and heat stroke, which will likely require hospitalization. Take care of yourself! Drink more water and take more breaks than usual if you have to be outside. There's no substitute for a good 20 minute break in the AC with an ice cold glass of water. While you're here, it doesn't hurt to remind you to check on the elderly, children, and furry friends over the next couple days as well.